Bundi is a peaceful yet exciting tourist spot. It is surrounded by the Aravali ranges on three sides. Located at a distance of 39 kilometres off Kota, the small typical Rajasthani town can be easily explored leisurely on a taxi or even a cycle. Bundi is known for its beautiful paintings all over. A serene lake and an old fort in the middle of the town, stand tough on the ravages of time. 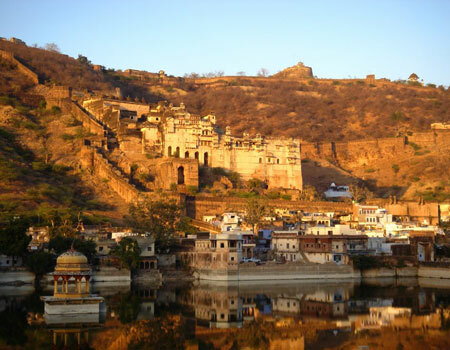 Those who are fond of unraveling history will surely love the quaint Rajasthani town, Bundi. The Taragarh Fort in Bundi enables the visitor to witness the royalty of the Rajputs restored till date. Bundi is also blessed with certain other architectural marvels in the form of beautiful forts, lakes, palaces and gardens. The melody of its elegance amazes one and all. The international airport in Jaipur is the nearest one, 220 kilometres from Bundi. Few trains also connect to Bundi from Agra, Kota and Chittor. It is well-connected by buses as well. Express buses enable you reach Bundi within 5 hours from both Ajmer as well as Jaipur.